My experience working with college classes has been that very few students actually want to pursue a career in sales. However, the rude awakening for most students is that as they approach graduation they’re going to accept a job in sales. I always open up a conversation at the beginning of class so I can find out what actually scares students about sales, and the most common answer I get is COLD CALLING. In life and business you only get one chance to make a first impression, and a cold call is just that, a first impression. For many people, approaching someone you don’t know is stressful regardless of the situation and setting. For my college students I liken cold calling to dating. Yep, dating. Think about the last time you were out and saw someone that you found attractive but didn’t know them. Now I want you to think about how terrified you probably were to go over and talk to that person. Sounds a lot like a cold call doesn’t it? When you really think about it, you have nothing to lose by introducing yourself. At worst, the person is rude or mean. If that’s the case then they’re probably not a good fit for you anyway. For the sake of learning, let’s pretend that you decide to stride on over to talk to that person. Your appearance and confidence are paramount to your introduction’s success. Always be self assured, but not cocky. Remember peoples’ brains can unconsciously detect if you’re nervous or scared. You’re standing in the person’s line of sight. You make eye contact with them, smile and open your mouth to speak… but what do you say?! Dale Carnegie said it best, “You can make more friends in two months by becoming interested in other people than you can in two years by trying to get other people to become interested in you.” As introductions and cold calls go, the first words out of most people’s mouth are often about themselves and not the person they’re talking to. Fail. 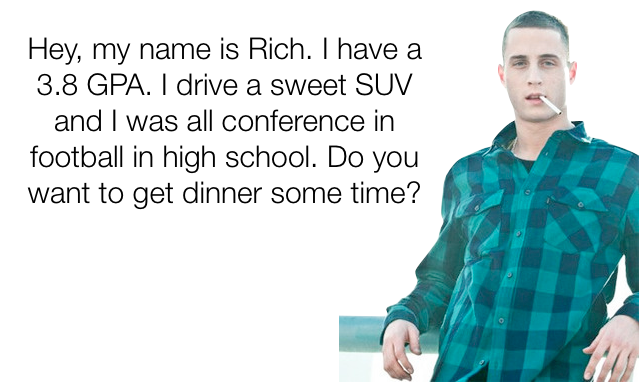 As you can see the language of Rich’s introduction is all about himself. The majority of women out there would probably not be enticed to spend more time with him because all he did was drop details about himself during his introduction. As you can see from the above example all this sales professional did was talk about his company. And much like the girl at the bar, the customer is probably going to pass on spending more time with this sales professional. WIIFM stands for What’s In It For Me. That is the question you need to ask yourself from the perspective of the other person you’re talking to. Life is an endless series of decisions, and all sales is helping influence decision making as it pertains to business. The best way to influence people is to put their needs, concerns, and goals before yours. Taking the WIIFM perspective of the person you’re talking with will make a world of difference in your initial interaction. Before you criticize my game, please keep in mind this is just an example. What I wanted to convey in this second scenario is that Rich is taking an interest in the other person by anchoring to an interest of hers. 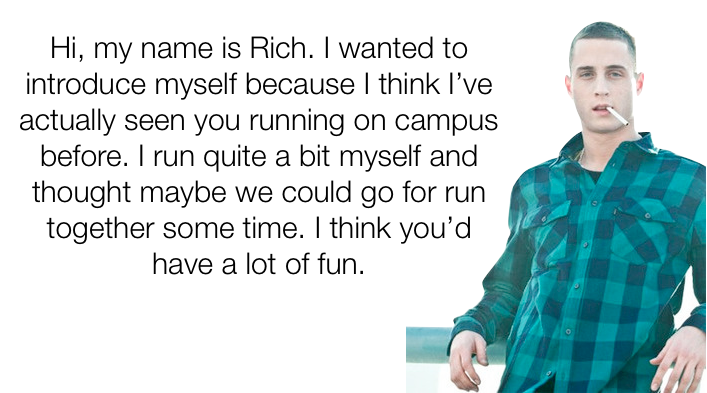 Rich is still the same guy as in first scenario, he just doesn’t have to be in a rush to get that information out so quickly. If he can share a common interest with her and let her know she’ll have fun by spending time with him she might be more inclined to actually do so. It amazes me how many times I have made introductions to customers without ever mentioning who I work for and still got the meeting. This is because the mind of your customer is selfish and all the things they want to hear are about their business. 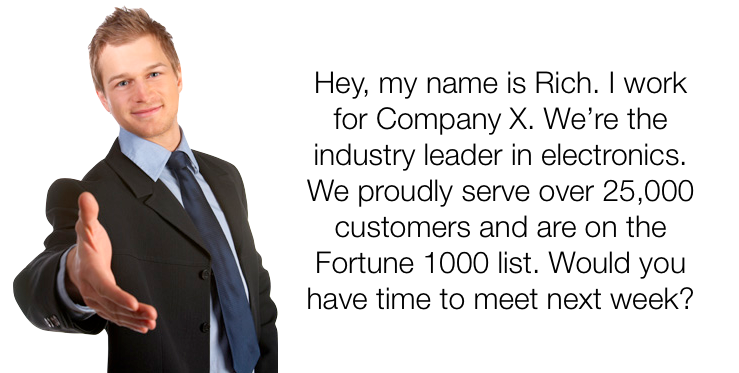 The customer could care less about Company X being an industry leader or a Fortune 1000 member. All the customer cares about is What can Company X do for me? If you’re speaking to their interests, needs, and goals you’re going to make a great first impression as a result of your cold call. The truth is if you’re going to be an effective communicator it’s all about taking an interest in the other person. If you’re trying to persuade or communicate a desire, keep the focus on the outcome or WIIFM for the other person. The best sales people aren’t talkers, they’re actually listeners. Seek first to understand, then to be understood. If you’re a college kid reading this I hope you’re able to think twice about the introductions you make personally and professionally.